Botanically called Phyllanthus emblica, syn. Emblica officinalis , (Indian gooseberry) it is a rich source of vitamin C, amino acid, tannin, polyphenolic compounds, fixed oil, lipids and other essential oils. It may be compared with ‘Amrita’ (nectar) of the heavens owing to the medicinal qualities of this divine fruit. Its regular consumption is an anti-dote for many ailments/disorders like acidity, septic fever, biliary colic, vomiting, insomnia, defective vision etc. 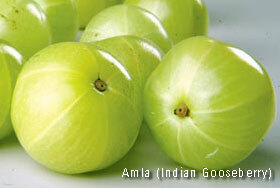 Amla tree is found in all parts of India. It is generally 20-30 ft. high. Its bark is rough and brownish in colour. It has regular branches, bluish yellow flowers, small leaves like that of the Imli (tamarind) tree. Its fruit is round and greenish yellow in colour with six segments and a hard seed inside. Among all the varieties that are available, the best is Kalami for its fruit has lot of pulp, very small seed and is comparatively less sour and bitter in taste than others. It is especially good for making jams, pickles, chutneys etc. Chyavanprash is also made from Amla only. Perhaps owing to its medicinal qualities the Hindus treat it as a very sacred tree and worship on ‘Akshaya Navami’. In the Kartik month (mid Oct. to mid Nov.) if one takes its dose regularly it provides complete protection against all the disorders due to cold. Amla is unique as it doesn’t leave its chemical ingredient even if it is heated. It is a tree whose no part is useless. It also has the atmosphere purifying qualities. Chemically, besides being the best source to get Vitamin C from, it also has gallic acid, tannic acid, sugar, albumen, calcium, protein, phosphorus, carbohydrates, irons etc. Taking Amla and Black Til (black seseme seeds) in equal quantity with honey or ghee cures mental and physical weaknesses. To revitalise brain take a cupful of sugarless milk with the murabba of Amla. Taking even one raw Amla every morning even with water makes one’s body enough resistance to fight with various ailments. Taking milk in the morning after licking one teaspoon of ground Amla powder mixed with honey imparts freshness and strength to the body. Intellect get sharpened if one takes the pulp of fresh Amla or Amla juice with honey or ghee every morning and evening. Washing eyes with cool water having Amla powder soaked and strained is good for the eyes and it also improves eye-sight. Washing the eyes with ground Amla and til powder water (soak Amla and Til powder in water overnight and strain it) in the morning cures burning sensation in the eyes. Have Amla powder washed down with milk to improve your eyesight. Eating 10 gms. of Triphala (the powder made by mixing even quantity of Hirda, Bahera (Behda) , Amla powders) with 1 tsp of honey keeps eyes very healthy strong and sparkling. Having Triphala powder with honey not only keeps eyes bright and shining but it is also very good for the digestive system. Taking Amla Murabba every day in the morning cures physical and mental debility. Taking Amla juice is ideal for keeping your head and eyes strong. Massaging the scalp with Amla oil before going to bed removes mental weakness. Taking Amla powder with cow’s milk or Misri (even amount) with water gives relief in heart ailments. Applying paste made up of dried Amla powder with Kumkum, Neelkamal and rose-water cures headache. Applying paste of Juice of 2 to 3 Amla or its pulp mixed with little rose water and 3 to 4 pieces of kesar (saffron) in it-on the affected part for 15 mts. relieves the pain of migraine. Taking 1 gm Amla powder, kala jeera and 2 gms. ground misri with cold water cures the problem of bed wetting. Taking milk after eating fresh Amla juice or dried Amla powder with gur (jaggery) cures stranguary. Applying paste of Amla near the naval portion helps in curing urinary problem. Boil 20 gm. pulp of dried Amla in 160 gms. water till 40 gms. is left. Then mix 20 gms. of Gur (Jaggary) in it. Drinking this potion helps in urinary problem. Taking crushed Amla pulp (after straining it) mixed with misri cures blood in urine. Taking 20 gms fresh Amla Juice with 10 gms. of honey and water twice a day cures problem connected with urination. Taking 3 gms. powdered Amla with 6 gms. honey every day for one mouth cures the problem of leucorrhoea. Leucorrhoea is also cured by taking powder of Amla seed with honey or mjsri regularly. Taking 20 gms. fresh Amla juice mixed with honey regularly for a month cures weakness of the generative system. Taking Amla juice or powder with honey purifies blood. Taking 5 gms. of powder (made from 20 gms triphala, 20 gms. black pepper, 10 gms. pure sulphur, 5 gms. of neem leaves and mehandi leaves-ground in fine powder form) with a glass of water twice a day cures all impurities of blood. Taking fresh Amla juice with honey checks diabetes. Taking Amla powder with radish helps in checking stone in bladder by breaking the stones and throwing it out with urine. The best time to have them is morning or evening. Have 1 tsp dried Amla powder with milk or water before retiring for the day. It helps in imparting movements to the bowels and keeping the system clean. Also taking strained water of mashed fresh Amlas soaked overnight in lukewarm water helps in evacuating the bowels. Taking 4 tsp fresh Amla juice and 3 tsp honey mixed in a glass of water relieves constipation. If constipation is caused by worms, take about 20 gms. fresh juice of Amla every day to kill the worms. Taking two tsp of fresh Amla juice with honey twice a day helps in taking out the phlegm and controls cold. Also, taking milk in which a little Amla powder and ghee boiled in the evening helps in dry cough. Licking Amla powder with honey regularly twice or thrice a day also cures chronic dry cough. Washing the head with Amla-juice mixed with water after rubbing the scalp for 10-15 mts. with fresh Amla juice helps in restoring the vitality of hair. Soak dried Amla, Harar, Bahera and Shikakai in an iron utensil overnight and mesh them nicely, washing your hair regularly with this strengthens the hair and checks hair loss. Applying the paste of Amla powder mixed in lemon juice on the hair 10 to 15 mts. before washing them with Amla water keeps the hair strong and shining. Dying the hair with the following herbal paste makes them turn automatically black and strong. Make the paste of Amla and Mehandi leaves and apply it on the hair. Keep it applied for about 15 to 20 mts. Then wash it off with lukewarm water. This will make your hair black and shining. Washing the hair with dicoction of Amla removes dryness of the scalp, checks dandruff and stops excessive fall and the greying of hair. Massaging the head with Amla oil imparts natural glow to hair, relieves mental tension and induces sleep. Soak 4 Munnakkas (big raisins) in juice of 4 fresh Amla. After one hour grind the soaked munakkas and mix it with Amlajuice. Taking this potion twice a day gives relief in Jaundice. Mix a churna in the following way. Grind each of Amla, dry ginger (Read more on health benefits of ginger), black pepper, 3 gms. of iron bhasm and little turmeric. Lick this churna mixed with a teaspoonful honey helps cure Jaundice. Taking fresh Amlajuice with old ghee-heated a little-regularly for a few says relieves stiffness of joints and helps in curing gout. Removing the spots left by measels, chicken pox, small-pox etc. Take bath with the water having Amla juice mixed in it. Also, apply the paste made of Amla and til in equal quantity ground in cold milk added with 3 or 4 drops of rose water on spots and let it stay for sometime and then wash it off with Amla soaked water. Doing gargles with water having fresh Amla juice twice or thrice a day gives great relief and helps curing the boils. After gargles apply fresh Amla juice on the boils and let saliva ooze out. Application of the Amla paste mixed with turmeric and-oil on- body makes the skin clear, soft and improves the complexion. Drinking Amla juice mixed with honey in the morning makes the complexion glowing and blemishless. Application of the Amla paste on the face and washing it off after 10 to 15 mts class pimples and heals up the spots so created. Take boiled pulp of Amla with honey two times a day relieves the pain in the bleeding. Taking Amla juice mixed with ripe banana 3 to 4 times a day during periods-checks profuse bleeding. Applying the paste made of Triphala powder mixed with cow’s urine-on the affected part-relieves the poisonous effects of insects. Drinking Amla juice will also help in such cases. Munching raw Amla or one piece of Amla Murabba washed down with milk is an ideal breakfast for staying healthy and living till ripe old age. Also, taking Chyavanprash (having enough of Amla) in the morning is also very good tonic for maintaining good health. Taking sharbat of Amla in summers keeps the body cool even in the height of summers.